Vegas, Ebola, and politics rule the day in this episode. Plus always things get personal. Lex and Stacey like to nudge each other about their personal lives and this is no exception. The subject matter is all over the place like only these two can do it. We wish we could capture all the things we talked about in one hour and tell you what we talked about in succession but this one was all over the place. But some definite ranting went on with our two f’d up hosts. 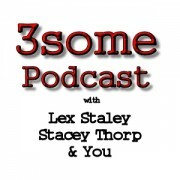 This is installment nine of Lex & Stacey’s quest towards informational perfection. This episode like some of our best is all over the place.